There’s been much discussion/debate/right-fighting among parents, for many years now, about the idea of “sneaking” or “hiding” vegetables and fruits in children’s meals to get them to eat well. It seems to me, just on the surface, that there are three essential camps in this discourse: the Jessica Seinfeld adherents, who basically believe that slipping pureed blueberries and spinach into brownies is as good a means as any of ensuring optimal nutrition; the firm opponents of such an approach, who will go to painstaking lengths to be certain that their kids know exactly what’s in their food and scorn such tactics as putting shredded zucchini into the spaghetti sauce without telling everyone; and the rest of us, who are somewhere in the middle. Yes, there’s a middle. In my very humble opinion, the blueberry/spinach adulteration is a) a criminal thing to do to a perfectly lovely chocolate dessert; b) probably not SO nutritionally valuable as to be really worth the effort; and c) not a good habit to get into, because even if you swear to yourself that this won’t happen, it’s the type of behavior that could easily lead parents to become a bit more lackadaisical about instilling healthy principles. Let’s face it. If YOU know that there’s some little bit of sneaky, stealthy produce hidden in every food your kids eat, you’re not going to be as concerned with WHAT they’re eating, and you’re certainly not going to feel that sweaty, prickly back-of-the-neck pressure to get them to JUST TRY A DAMNED BITE OF SOMETHING GREEN, OH GOD, BEFORE THEY GROW UP DISEASED AND MALNOURISHED AND YOU GO DOWN IN HISTORY AS THE ONLY PARENT WHO EVER RAISED CHILDREN WHO JUST NEVER EVER ATE A VEGETABLE EVER. But seriously. Here in the middle of the stealth veggie road, I sort of look around me and think, well, there’s nothing WRONG with adding some zucchini to a pasta sauce, or some carrots to the meatloaf, or some spinach to the fruit smoothies — because those are foods you’d want your kids to be eating anyway, right? If meatloaf with carrots is the way you roll in your house, then that’s meatloaf as far as your kids are concerned, and it’s just a recipe variation. You’re still going to serve it (I hope) with the peas and salad and whatever else you might have. And your kids are still going to have to go through the requisite kid-torture of moaning and complaining and pushing those peas and salad greens around their plates and eventually, balefully, shoving a few into their mouths, followed hastily by the pained expression and the quick gulp of milk that will help them choke down the horrible weeds you’ve tried to pass off as their dinners (even though they probably secretly like peas, or at least don’t think they’re so bad…but they like to torture you more than they like the peas). There’s still got to be a discourse at your table about what food choices everyone needs to make, and there’s no “nutritionizing” of a food like brownies — which, as far as I’m concerned, should ALWAYS be considered strictly empty calories, for pleasure’s sake only. Once you start trying to fool around with them and make them into something slightly more than a “sometimes treat” kind of food, you not only run the risk of ruining the pure, lovely hedonism of a perfectly good dessert…you actually start to blur the lines of making clear, intelligent food choices. It was with all this playing in the back of my mind that I approached tonight’s cooking tasks. I’d planned to make stuffed peppers — but not the ones I grew up with, filled with a rice and meat mixture and covered in tomato sauce. I never much cared for those, and they’re too heavy for this time of year anyway. No, I thought, I’d make mine as summery as I could, with lots of fresh farmer’s market vegetables. I did put some meat in them, but skipped the grains, and topped them — or at least, mine and J.’s — with a cool, creamy spoonful of ricotta cheese. As I tinkered with the vegetables, preparing the stuffing mixture, I had to decide how small to cut everything. Instinct might dictate that I be a bit stealthy here, and either finely chop or even grate things into the meat filling, thereby making a more homogeneous texture AND a less suspicious-looking dinner plate for the kids. Of course, that would also have involved making a less attractive-looking dinner plate, and I wasn’t sure I wanted to mask the prettiness of all those colors. Besides, I wondered, what would happen if I presented something so shockingly new in a totally counterintuitive way? What would happen if I LET THE KIDS SEE ALL THE VEGETABLES? I cut things big. Bigger than was probably necessary, even, but the rationale was: they’d be big enough to see, identify, and even pick out, if anyone wanted to do so. BIG vegetables, unstealthy vegetables, naked to the discriminating child’s eye, would give my kids a real choice about what they wanted to eat. And it turned out that not only was I right abut that particular effect — L. chose to try some of everything, and found that he liked the papaya squash quite a bit, while P. was more reserved and wanted some help from Mommy to try some little bites of meat and peppers — but from a culinary perspective, the still-toothsome bite of the vegetables made for a refreshing stuffed pepper experience. One quick word about the ricotta I used, before I share the recipe: We are absolutely blessed to live in Rhode Island, where we can get Narragansett Creamery’s award-winning Renaissance Ricotta. It has actually ruined me for any other ricotta cheese. This stuff is so creamy, so rich, so downright good and fresh and almost subtly sweet that I’ve been known to eat it straight from the container with a spoon. I do many things with this cheese, including making a killer faux-ice-cream sandwich that I’ll share with you soon; but I know not everyone can get Renaissance Ricotta. It’s okay. Just try, if you can, to get something a bit better than the usual grocery-case ricotta; once you’ve tasted the real stuff, it’s hard to see much more than a passing resemblance between the two. Preheat the oven to 400 degrees. Cut the peppers in half and remove the stems, ribs and seeds carefully. Place the pepper halves cut-side-down in a 13×9 baking dish, drizzle with about a tablespoon of oil, and roast for 15 minutes. While the peppers are roasting, heat a tablespoon of olive oil in a heavy skillet over medium-high heat. Saute the onion, garlic, and ground beef together until the beef is browned and the onions and garlic are translucent, about 5 minutes. Add the tomatoes, squash, and eggplant, stir to combine, and cook unti the eggplant is softened, about another 7 minutes. Season with the salt, pepper, and oregano, and add the balsamic vinegar. Cook an additional 2-3 minutes, stirring occasionally. 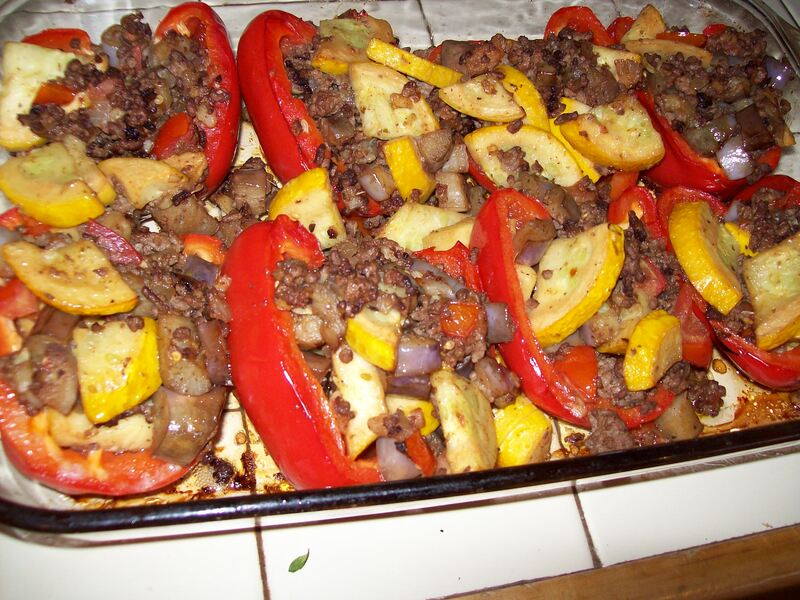 Remove the peppers from the oven and, using tongs, flip them over so they’re sitting cut-side-up in the baking dish. 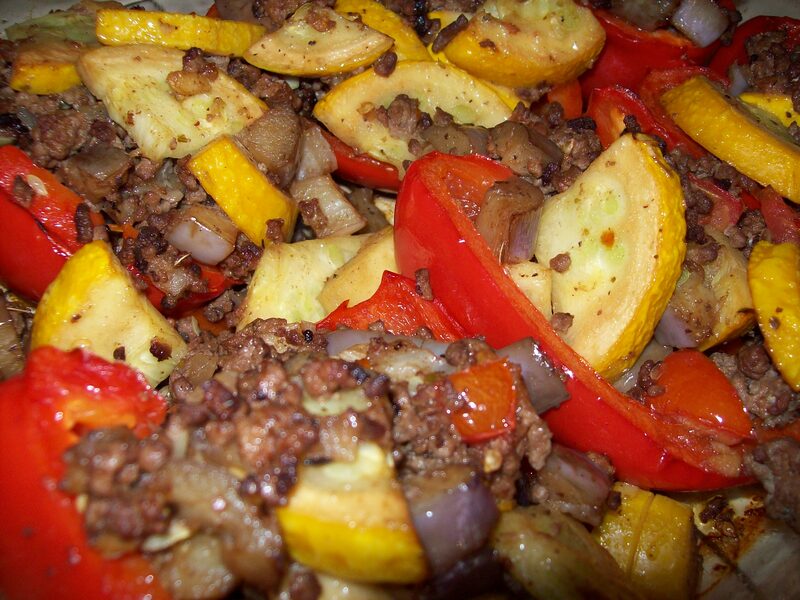 Fill each pepper with a generous mound of the meat and vegetable mixture, then return the peppers to the oven and bake for an additional 10 minutes, just until the peppers are fork-tender (but still have some bite). Remove from the oven and let cool slightly. While the peppers are cooling, mix together the ricotta, remaining tablespoon of olive oil, and chopped basil in a small bowl. 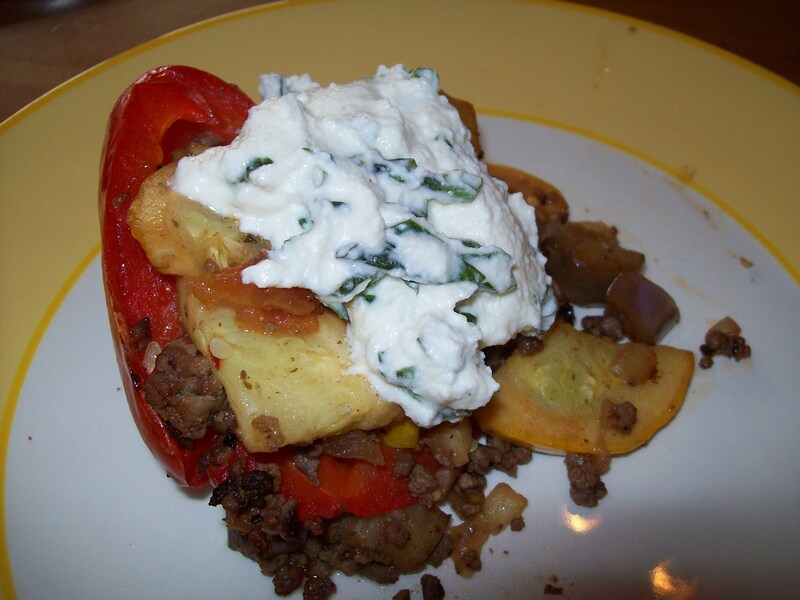 Before serving, top each pepper with a dollop of the ricotta mixture. This entry was posted in Cooking, Feeding kids, Food culture, Parenting and tagged cooking, family, Farmer's Markets, feeding kids, food, kids' health, meal planning, parenting, recipes, veggies. Bookmark the permalink. Oh my gosh, that looks so good!!! Sometimes you just amaze me. I read your posts and find myself nodding my head in agreement. I agree 100% with your philosophy regarding “stealth” food, plus I appreciate the “check” I just got in my head regarding slipping nutrients into fun foods. I could totally see how that could blur into not making good choices in other ways. I wanted to comment on your post regarding Who Nu cookies but I had just seen them the weekend before at my SIL’s house and I think the smoke was still pouring out of my ears at that point. I am so glad you are able to tackle these subjects and communicate them so well. Thank you. I know what I’ll be making tomorrow night for dinner! We have a mid-week farmer’s market near me so I’ll be stocking up later today. Oh, thanks! That’s so sweet. 🙂 I hope you like the peppers! They were really a nice change, I thought.